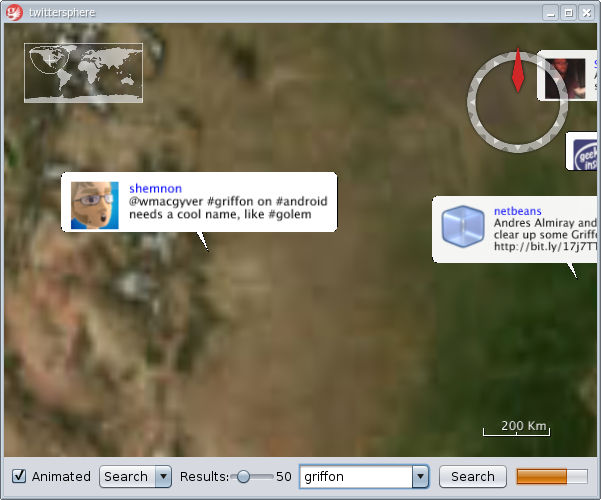 Griffon 0.1.1 released just in time for the gr8conf 2008, actually a few hours before Jim Shingler took the stage and talk about making a Griffon frontend for Graeme Rocher's Twitter server made with Grails. Jim made the code available at this link.Speaking of gr8conf, Peter Bell has written juicy and insightful reviews of all the sessions. 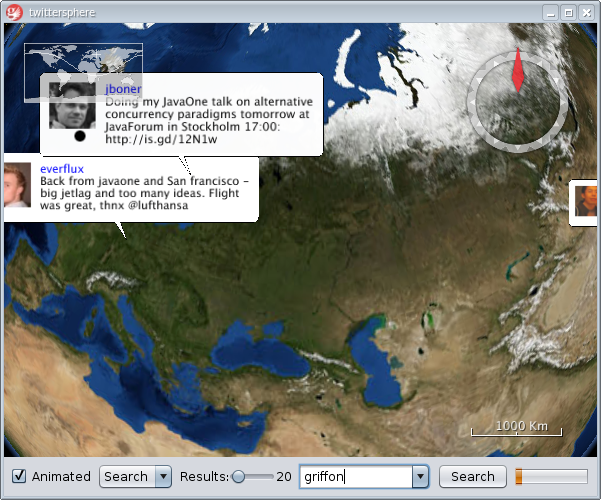 The same Jim Shingler announced the availability of gConfig 0.1 just a few days shy of JavaOne 2009 starting. gConfig is a Griffon based application that helps you configure other Griffon applications, for example it will list all currently available plugins allowing you to pick which should be added to your application. It also lists useful 3rd party libraries like MigLayout, GlazedLists and FamFamFam icons. Lastly it may add useful templates for setitng up a Menubar, statusBar, toolBar and help menu, complete with a Tip-of-Day feature. Boostrapping a Griffon application just became a lot easier. These are the stats, impressive! Then Jim Shingler strikes again with another Griffon plugin release, this time it is an AbeilleForms Designer builder. AFD is a visual designer similar to NetBeans Matisse and JFormDesigner with the added benefit that its Open Source and free. This plugin allows you to insert any AFD form into your Griffon application. While people were circling the halls of the Moscone Center, Bob at Transentia posted a good write up on Riding the Griffon, in other words how he created a Griffon application to scratch an itch, learning some Griffon tricks in the process. Dierk's talk caused quite the conmotion in the audience (he is such a great speaker), Geertjan was sure to capture but one of the facets shown in that talk, which is having Groovy provide the logic for a JavaFX powered application,demonstrating that both languages can coexist in the same application. That last link made think back on FxBuilder, which was also demoed on stage by Dierk running on NetBeans + Griffon, prompting an update on the current state of affairs regarding FxBuilder. Bottom line is that keeping up with the changes coming in every JavaFX SDK is an ardous task, if anybody likes to lend a hand bringing the builder up to speed please let me know. Speaking of database powered Griffon applications, while there is no GORM plugin yet you can use Groovy SQL and Groovy's GSQL module to setup a database, here is a mini howto by yours truly. Back at juxie.com/technow we find a couple of posts on starting up with griffon: The Setup and The Hit. We hope to see more posts of the "Grinding Griffon" series. Lastly there is a new couple of things that can make styling a Griffon application much easier, mainly CSSBuilder and its companion Griffon plugin. If you ever wanted to style a Swing application with CSS here's your chance, this is another update before release 0.1.